While I absolutely love spring fashion, there is something about homeware at this time of year that I get so excited about. We wave goodbye to all the thick, fluffy blankets, burnt oranges and burgundies and make way for pastel hues, floral prints and spring accents. Like the phrase 'having a spring clean', I feel as though spring homeware well and truly reinvigorates and refreshes the home, brightening up our spaces and giving them a new lease of life. Plus, I absolutely love pastel no matter what time of year it is, so spring is always a big hit with me. 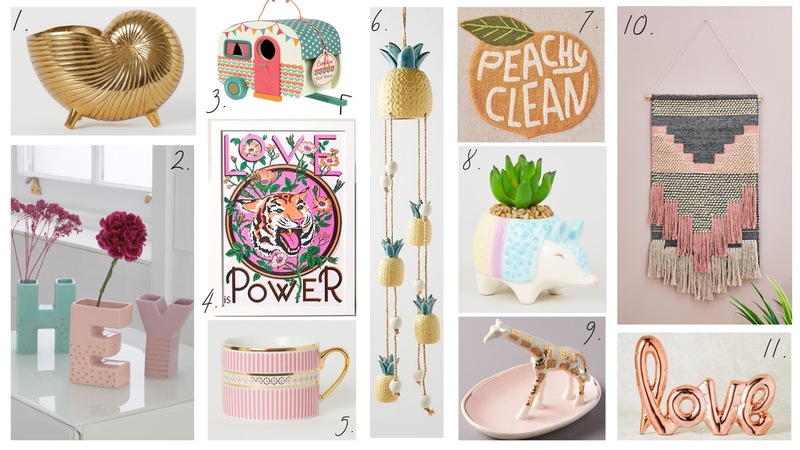 As the homeware in the shops is so incredible at the minute, I thought I'd put together a little spring homeware wishlist of some of the best bits I've spotted online. Shock horror - the first item I've got to mention isn't actually pastel! I'm really into gold accents at the minute and love the Little Mermaid vibes this shell planter is giving me. It's a really unique piece unlike anything I've seen in the shops before now and I don't think it's a bad price either. I do think it's probably smaller than I'm envisaging, but how cute would it look with a string of hearts plant in it? As soon as I saw these vases I knew I needed them in my life. Pastel? Tick. Gold detailing? Tick. Super cute? Triple tick. Honestly, I just need an excuse for somewhere to put them and I am so getting these. I think they'd look cute on a side table or even on a shelving unit. I've been after a birdhouse for my garden for ages, but could never find anything very 'me' - they're all quite plain and boring. However, as soon as I saw this one it went straight to the top of my wishlist. I've never seen anything quite like it before and it'll look adorable hanging off the tree in my garden. What a cute little house for the birds (and me) to enjoy! Oliver Bonas has so many gorgeous prints in at the moment and this one in particular caught my eye. I just love everything about it - the colour, the tiger, the flower detailing... I think it bring an amazing pop of colour into any home. You just can't go wrong in H&M when it comes to kitchenware. This mug is super cute; I love the gold detailing and it's just 'my' shade of pink. Such a great price too! Okay, so whilst I can't really justify splashing out £40 on a wind chime, I have to admit I've never seen anything like this before and just how cool would it look in the garden during the summer? Again, this is definitely on the pricey side but if you're looking for a 'talking point' bath mat that screams personality then this is it. Urban Outfitters are amazing when it comes to cool pieces like this - they actually have a whole range of amazing Insta-worthy bath mats. I'm sorry, but how cute is this?! It's pastel, the cutest little armadillo AND it's a fake cacti so I'm not going to kill it... ticks all the boxes for me! Anthropologie manage to nail trinket dishes and jewellery boxes every single time and this is no exception. I absolutely adore the giraffe one - it's so pretty I might actually be inclined to dust it! Okay, so this is currently out of stock online but I'm praying to the homeware gods that it will come back in soon because HOW PRETTY!? If not, there's always a chance you can get it in your local store. I need this so badly for my office. I actually have the real-life balloon version of this (I got it around Valentine's day a few years back and can't seem to part with it) but I love this as a cute little ornamental piece. Definitely a must-have for anyone looking for some rose gold accent pieces! Let me know what your favourite piece from my wishlist is, and if you'll be picking any of these bits up this spring!